Kangaroo is a 1982 arcade game developed by Sun Electronics and distributed by Atari. The game is similar in play to Donkey Kong (as I am sure was intended by Sun) with a Kangaroo as the main character and monkey’s as the antagonists. The goal of Kangaroo is to score as many points as possible by collecting fruits and ‘punching’ the monkeys. The monkeys are diabolical and will throw or drop apples and apple cores at the kangaroo. If an apple hits your Kangaroo, you will lose a life and have to start over at the bottom of the screen. You can advance to the next screen (and score some bonus points) by rescuing joey at the top of the screen. You can also score additional points by ringing the bell, which will regenerate the fruits. The arcade units of Kangaroo ran on a Zilog Z80 microprocessor with a General Instruments AY8910 sound generator. 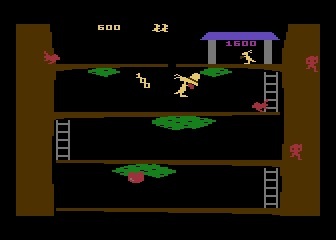 Kangaroo was ported to the Atari 2600, the Atari 5200, and a version was developed for the Atari 8-bit computer line, but never officially released. Although Kangaroo was only a modest hit in the arcades, Kangaroo was featured on the CBS Saturday Supercade cartoon lineup in 1984. In 1983, Atari released Kangaroo for the 2600. Given the limitations of the 2600 back in the eighties, Kangaroo is a pretty good port. The graphics, although monochrome, are pretty well done and the flicker found in many 2600 games is minimal. Kangaroo for the 2600 has solid control with a standard CX-40 joystick and the 2600 version features three of the arcade’s four levels. Given the limitations of the 2600’s TIA chip, the sound for Kangaroo is also pretty well done. Kangaroo for the 2600 is not an easy game to play and it is surprising addictive….you will find yourself hitting the reset switch over and over! The 5200 version of Kangaroo was also released in 1983 and is a solid arcade port. The graphics are well done, but still mostly monochrome. The 5200 version does feature all four levels of the arcade version and the sound is also well done, but not substantially better than the 2600 version. Control with the standard 5200 joystick takes a little practice, but Kangaroo does not suffer from the control problems that many 5200 games have. One strange thing about Kangaroo for the 5200 is that there is not any ‘game over’ message. When you have lost your last life, the game just stops. The first couple of times that I played it, I thought that the game just froze. Even the 2600 version at least takes you back to the start screen. Sadly, no 7800 version of Kangaroo was ever developed for the 7800. For the Atari 8-bit computer line, the 5200 version has been ported over and is available to be played. If you like Donkey Kong, you will also like Kangaroo. Both the 2600 and 5200 versions are inexpensive, easy to come by, and fun to play. If you have a 2600 or 5200, you should pick up a copy of Kangaroo. Hopefully, one of the 7800 programmers will develop a 7800 version. With the latest advances in cart boards for the 7800, it should be possible to produce a near arcade perfect port. Also, with the advances in cart technology for the 2600, I would not be surprised to see one of the 2600 programmers develop a more arcade perfect version for the trusty old VCS! Categories: 2600, 5200, 7800, Atari, Game Reviews | Tags: 2600, 5200, 7800, Atari, Kangaroo, VCS | Permalink.